This grocery store friendly recipe is a sweet, savory combination of modestly tart cranberries and pumpkin that has been wrapped and baked in a flaky phyllo crust. It is served with an herbed cranberry dipping sauce. The filling and dipping sauce may be made ahead of time. Thaw phyllo dough sheets according to package directions. In a bowl, combine cranberries and sugar and mix thoroughly. Set aside. In a pan, over medium heat, add 1 teaspoon oil. When oil is hot, add celery and onion. Sauté until onion is translucent, and then transfer celery and onion to a medium bowl. To the bowl add the pumpkin, nuts (other nuts may be substituted, according to preference), and cranberry-sugar mixture. Refrigerate for one hour or until filling is cool. When filling is cool, prepare phyllo dough sheets. The sheets come wrapped in plastic. Carefully unroll the sheets and place them on your countertop. Place the plastic the sheets came wrapped in on top of the sheets. On top of the plastic, place a damp towel. Do not expose sheets until immediately before use. Remove only the sheet(s) with which you will be immediately working. Remove a sheet of phyllo dough and brush or spray with a portion of 1/4 cup of oil. The sheets I used were 9 inches by 17 inches. (If your sheets are slightly different in size, follow the same directions.) Fold the longest side in half and then in half again, so you have a four-layer-thick 9 inch by 3-1/2 inch strip. Put about 2 tablespoons of filling (a cookie scoop’s worth) at one end of the strip. 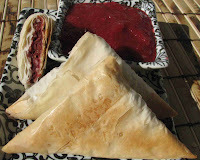 Fold the phyllo dough in a triangle pattern, pushing the filling toward the corners as you fold. At the end of the strip, brush the remaining dough with water. Fold the last of the strip of dough onto the triangle and smooth with more water, if necessary. Spray or brush the triangle with oil. Repeat for the remaining filling. Cook on an ungreased cookie sheet at degrees 350 degrees F for 30 minutes, or until golden brown. Serve at room temperature. In a saucepan, bring the water and white sugar to a boil over medium heat. Then add all remaining ingredients. Bring to a boil. Reduce heat and simmer gently for 10 minutes, stirring often. Remove from heat. The dipping sauce may be made ahead of time and refrigerated. If refrigerated, bring to room temperature before serving. Oh, no! The format of my recipe is a big block of words! Here's an easier to read format of my recipe - so you can all LOVE it. You needn't bow. I accept gifts of chocolate. if i didn't know better, i would guess this was cammy's recipe. that boy and his pumpkin! :) j/k.